Nike's enjoying the World Cup spotlight -- but how did the fourth-quarter perform? Athletic-apparel giant Nike (NYSE:NKE) was up about 3% aftermarket last Thursday following its fourth-quarter earnings report. Nike is currently in the spotlight thanks to the World Cup -- an advantage largely missed by competitor Under Armour (NYSE:UAA). Did the fourth-quarter report give investors any more reasons to celebrate? Analysts estimated $7.3 billion in fourth-quarter revenue with earnings per share of $0.75. Nike reported $7.4 billion and $0.78, respectively, marking the sixth straight quarter that the company either met or beat estimates. These metrics provide a quick glance at the quarter's performance, but every earnings release deserves a closer look. What were the three key takeaways from Nike's fourth-quarter earnings release? Fourth-quarter net income barely budged compared to the prior year's quarter, but full-year profit was up 10% to $2.7 billion. The company attributed the growth to a reduced number of outstanding shares -- or stock buybacks. Nike implemented a four-year buyback program in late 2012 with the goal of repurchasing $8 billion in shares and had purchased $3.4 billion -- or nearly 52 million shares --by the end of fiscal 2014. The fourth quarter only featured $912 million of that total. Why was the fourth-quarter profit relatively flat? Blame the costs. Selling and administrative expenses were $2.4 billion in the quarter -- up 21% year over year. Roughly two-thirds of those expenses came from the operating overhead involved in expanding the high-margin direct-to-consumer, or DTC, business. The remaining costs were primarily driven by marketing costs tied to Nike's visible presence in the World Cup. Full-year selling expenses were up 12% to $8.8 billion due to sports marketing, product launches, and the DTC expansion. Did the DTC costs pay off in the margins? The fourth-quarter gross margin increased 170 basis points to nearly 46%, while the full-year margin was up 120 basis points to 45%. How do those numbers compare to Nike's historical performance? 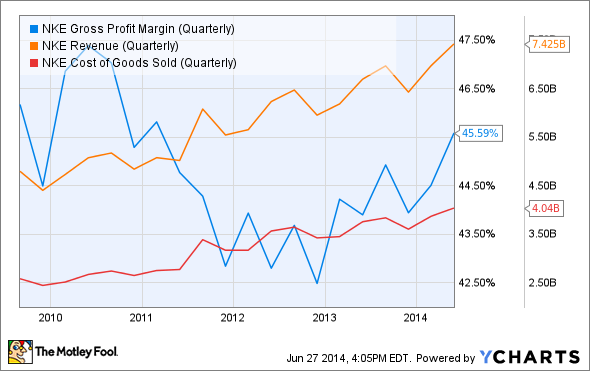 Nike Gross Profit Margin (Quarterly) data by YCharts. After a weak 2012, margins recovered over the past year as revenue grew at a faster clip than costs. Higher item prices and DTC sales accounted for most of the revenue growth. DTC sales in 2013 were up 22% year over year to $5.3 billion, excluding foreign currency changes. Nike's fourth-quarter report showed the company continuing its slow but steady growth. How does Nike stack up to the competition? Under Armour is scheduled to report second-quarter results on July 24. Analysts estimate $571 million in revenue and $0.07 in EPS. The company has reported positive surprises on both metrics for the past five quarters. The deeper metrics might not prove as rosy when it comes to year-over-year comparisons. CFO Brad Dickerson warned during the first-quarter conference call that this year's second and fourth quarters may seem weaker by comparison due to Under Armour's outperformance during those quarters in the previous year. How do Nike and Under Armour compare in the bigger picture? Nike has a $67.5 billion market cap with a 1.2% dividend yield and a forward P/E of 21.3. Under Armour's market cap is $12.6 billion with no dividend and a whopping 52.2 forward P/E. Dividend investors would obviously favor Nike. Under Armour still has growth potential, particularly abroad, which only accounted for 10% of total revenue in the first quarter. Under Armour shares have risen more than 100% in the past year, so the market has already baked a great deal of optimism into the price. The fourth-quarter report carried some expected results from Nike, such as the World Cup expenses. Nike had a solid year partly due to the DTC expansion that should continue to assist margins moving forward. Keep an eye out for Under Armour's earnings report in just a few weeks.